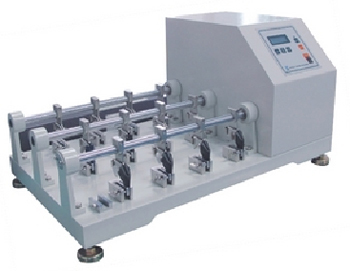 The Bally Leather Flexing Tester is used to test the flexing-resistance of leather for production of vamp, clothing materials, or bags. The test is run with a speed of 100CMP and flexing angle of 22.5°. The Bally Leather Flexing test is conducted till the piece of leather cracks. The time taken is recorded for flexing-resistance. It has a memory function and can test more than one specimen at a time. Custom-made number of specimens for test is also available. The Bally Leather Flexing test can also be done the above method for fixed times and note if it has cracked. Grip (Optional) A type 6 sets, B type 12 sets. Power 1 Phase, 110V/60 Hz or 220V/50 HZ or others.